The Red-lined Aeolid lives on shallow water reefs (intertidal down to 30m) where it feeds on the polyps of hydroids (sea ferns). This beautiful and widespread species grows to approximately 40mm in length and exhibits numerous club-like cerata, each with a pink/red/white banded tip. The cerata each contain an extension of the digestive gland, and presumably this species has some ability to re-use ingested stinging cells (nematocysts) of its hydroid food/host for defence, as occurs in other related species. 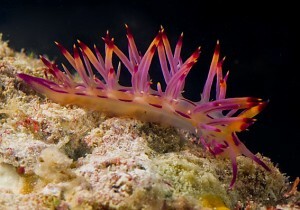 The Red-lined Aeolid lays strings of yellow eggs on hydroid stems. Indo-Pacific: Temperate, subtropical and tropical Australia.